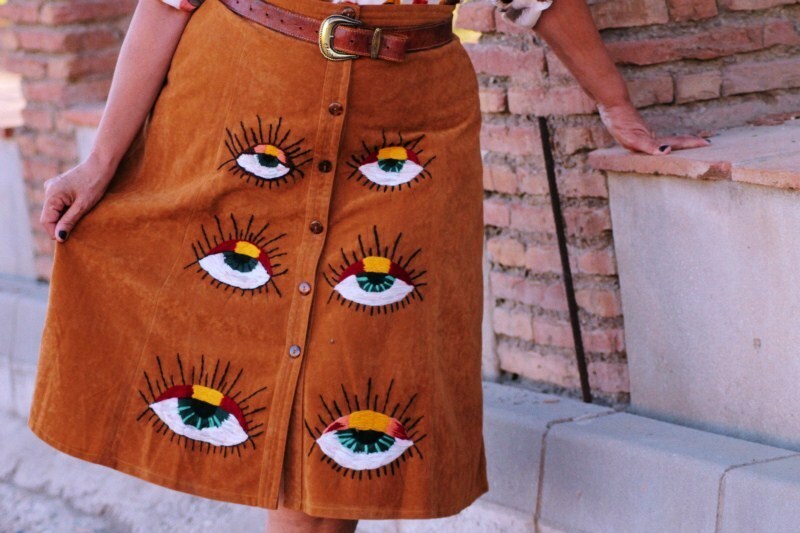 I found this skirt a bit plain, so I gave it a Schiaparelli touch by embroidering eyes with leftover wool I found in the house. I added a bird applique to the feather print blouse. 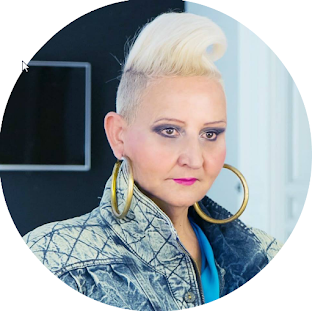 Encontraba esta falda muy lisa , así es que le dí un toque Schiaparelli bordándole ojos con lanas que encontré por la casa. 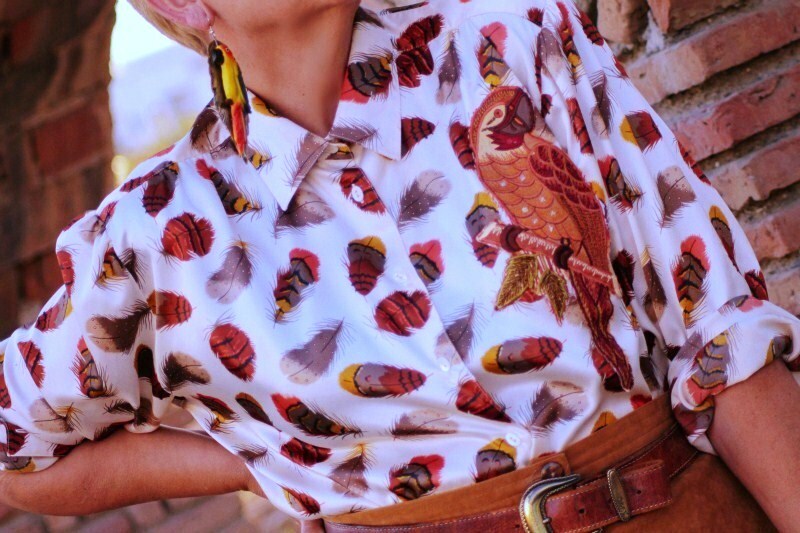 A la blusa con estampado de plumas le añadí el pájaro de otra blusa en forma de aplique. Posted by mispapelicos at 8:56 a. m.
I like when there's humor in clothes. Humor is Beautiful. Que falda tan bonita y original!!!! I love this look. What an inspiration you are! The bird applique is gorgeous and the eyes, simply stunning. 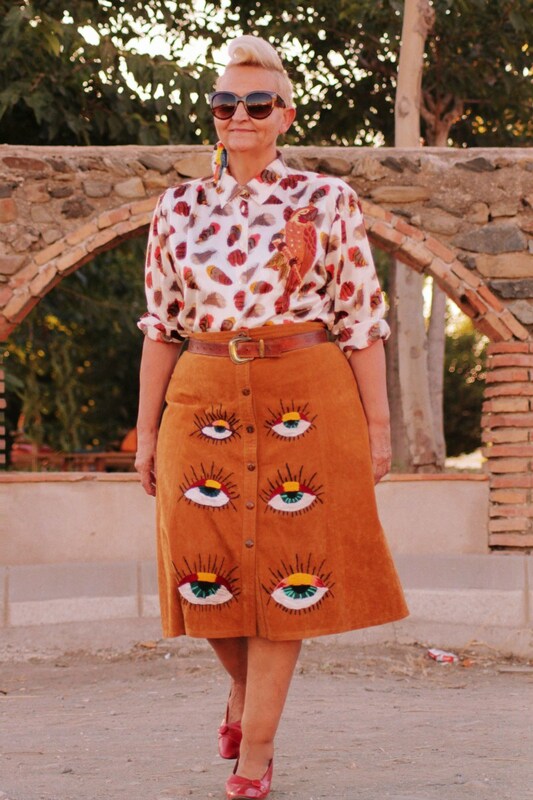 Amazing look my friend, I'm desperately in love with your skirt! You are always so fabulous, that skirt is so quirky and cool. Brilliant! Your way is infinitely better than the original. I try to individualize some of my clothing. My intentions may be there but I get sometimes get stuck in the execution phase. I love your sense of humour....and your fantastic style! Parrots and feathers and fabulous eyes....all in a fabulous autumnal palette. Buen viaje my friend!!!!! So excited for you, you totally deserve it! Tons of love!! Haces que una prenda normal y corriente se convierta en una maravilla gracias a esas manos que tienes, que parecen varitas mágicas! The skirt is amazing! You're so creative. You are so good with needle and thread. Love the skirt and the shirt. Flattering shape and so you. This is such a great outfit! I love the colors and the shirt's print! Que estilazo tienes, me admiras. I'm exactly the same way, I love to alter my clothes.......this skirt is phenomenal and I really like that shirt.